Protects the sinuses against water entry thanks to it's ergonomic shape and exclusive design. The soft pads are easy on the outside of the nose and don't leave mark, includes a silicone strap. Swim better with zero water infiltration. Designed for pro swimmers, our new Earplug Pro has a unique three-ring form that effectively stops water from entering your ears. The largest ring prevents the earplug from being pushed too far. The Arena Dome Earplug Pro offers a dome shape that allows for a perfect seal while still ensuring ease of insertaion and removal. Keep water out with the Arena Super Nose Clip II, for a more comfortable swim. 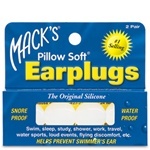 Super soft hearing protection (not for swimming). User preferred teal color makes them as easy on your eyes as they are on your ears. #1 Doctor Recommended Earplug Brand to Prevent Hearing Loss. Great for sleeping, studying, power tools, shooting sports, travel, loud events, etc. Noise Reduction Rating (NRR) – 32 decibels. The original modable Silicone putty earplug. Focuses on comfort and molds to the unique contours of any ear. The ear plugs have a comfortable conical design for a more secure, leak proof fit. They are soft, flexible and come in a reusable case. Flexible Anatomic Bridge Ensures Optimum Fit. Soft Silicone Nose Pads for Comfortable Fit. Comes with Storage Case. These hypoallergenic silicone ear plugs optimum ear protection against water, reducing the risk of water and cold air entering the auditory canal during swimming or showering. Comes in sets of two with storage case. This Latex coated sprung metal clip is lightweight, secure and comfortable, letting you concentrate on streamlining your stroke. Keep your ears nice and dry with the comfortable Arena Ergo Silicone Earplug. Comes with carrying case. 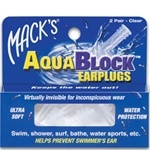 Comfortable, and effective ear plugs can be molded to ear size creating the perfect seal. 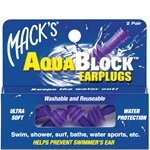 Includes two (2) sets of ear plugs – 4 reusable plugs with carrying case. Ergonomic shape for ultimate comfort. Easy to put in and remove. Care box included. 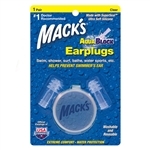 Ultra Soft, pre-molded flanged earplugs Macks AquaBlock pre-molded flanged earplugs are constructed of silicone and designed for super soft, super comfortable, waterproof protection. The Ear Plugs use a specialized shape that conforms to your ears, effectively sealing water out without the plugs going too far into the ears. Lightweight competition nose clip with secure and confortable fit. Latex coated spring stainless steel clip. Soft silicone for comfort fit. Comes with carrying case. Lightweight flexible nylon frame. Improved frame shape fits the contour of the nose bridge. Soft TPR pads provide a tight fit. One size fits most. Care box included. The Ergo Swimclip is the latest evolution in low profile, swim clip technology. These Swimclips showcase hypo-allergenic TPR nose pads and a polyurethane frame for lightweight comfort. Includes four ear plugs and storage case. Ergonomic design for left and right ears which provides optimal fit. Comes with carrying case. Flexible anatomic bridge ensures optimum fit, Soft, Silicone nose pads for unparalleled comfort, Comes with reusable storage case. The silicone nose pads offer maximum comfort. The anatomic design of the Nose Clip fits most noses comfortably and keeps the water out. TYRs Silicone Molded Ear Plugs feature a hollow stem to ensure minimal hearing disruption while swimming. They are specially shaped to fit left and right ears respectively. Includes storage case. One size fits all.